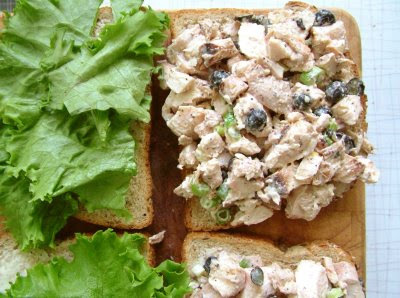 The recipe for my chicken salad is probably the most requested of all of the dishes I make. It is a staple at any shower or luncheon and everyone is always scraping the bowl! I love the D.C. Chicken Salad at Corner Bakery and wanted to create something similar. It's not quite the same, but it is dang good! I actually use canned chicken from Costco... shhhhh... but have also used a store bought rotisserie or just baked chicken and shredded it. I prefer shredded chicken to cubed because you can get more flavor in each bite instead of just a big piece of chicken. All measurements are approximate and can be changed based on what you like. Mayo (I use light mayo - you can't even tell a difference!) Mix in a big spoonful at a time until it looks good to you. Mix everything together. This is a great make ahead dish and does better the next day. You may need to add more mayo the next day if it looks a little dry. Serve on a sandwich or with crackers.